Beside all at Industrial & Scientific, you can supply yourself with low cost safety equipment, work wear and good maintenance supplies. - Commscope Enterprise Solutions capabilities will certainly be a good safety to you, and a welcoming solution for your bargain. CommScope / Andrew can be trusted when it comes to protection regulatory requirements and standards. Now you can afford to supply your department of research with new line of low-priced equipment and consumables. 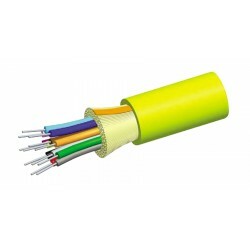 COMMSCOPE Plenum Distribution Cable, 24 fiber single-unit. With our surprising items we provide value for money and enjoyable shopping. Be distinctive with a quality piece you introduce by buying from us. Whether you need an air of sophistication or just practicality, you will appreciate our choice of captivating items. These commodities will bring sheer excitement to you and give you satisfaction. Find a huge variety of similar fantastic products bellow. If you have any questions, don't hesitate to contact our Customer Service department, after all, they are here for you. For a large variety and more related items, please visit other sub-categories for anything you need.